How LOYAL Are You to Jesus Christ? Readers of Plain Truth are responsible for the KNOWLEDGE they receive! Are you ACTING on it? Do you know what JOB will be your reward in the literal GOVERNMENT of God soon to be set up on this earth? WORLD events are speeding up. Prophecy is being fulfilled with almost terrifying speed! Strange things are happening in the weather. Experts are becoming alarmed. Gigantic earthquakes and volcanic eruptions are in the making. Great nations are being brought low by drought. Literally dozens of specific prophecies are being fulfilled. Why? Because the LIVING Christ is very much in charge. Seated at the right hand of God the Father, in heaven, is the LIVING Jesus Christ. According to His master plan, He is beginning, in a new way, to intervene in human affairs. For those who truly believe in the inspired Word of God, Christ is our living Head — our Master, our Ruler, our Boss. He has ascended to the right hand of God the Father. It is He who "shall JUDGE the quick and the dead at His appearing and His kingdom" (II Tim. 4:1). For God "hath put all things under His feet, and gave Him to be the HEAD over all things to the church, which is His body, the fullness of Him that filleth all in all" (Eph. 1:22-23). We know that HE is the one actually in charge of world events. And He is directly in charge of this very Work — the Work which God has raised up to WARN OUR PEOPLES OF THEIR SINS (Isaiah 58:1), and to foretell the soon-coming government of God as a warning or WITNESS to all nations (Mat. 24:14). Yes, Jesus Christ is the literal, active HEAD of this Work — the WORLD TOMORROW broadcast, Plain Truth magazine, The AMBASSADOR COLLEGE CORRESPONDENCE COURSE, etc. That is WHY we speak and write with such authority and POWER. That is why we are able to be specific with the prophecies of God's Word — not beating around the bush with sweet platitudes of vague generalities. That is why we KNOW what is about to happen in world events — when, where and why. The living Christ — who directs this Work — thunders to you: "Not everyone that saith unto me, Lord, Lord, shall enter into the kingdom of heaven; but he that DOETH the will of my Father which is in heaven" (Mat. 7:21). You, personally, need to be a DOER of the things you hear through this Work — through these very pages of Plain Truth magazine, month by month and year by year! Of course, you need to check anything you hear from any source to be sure it is GOD'S will. But do you just sit around, year after year, and theorize about it — meanwhile fallowing the rest of this world's society like a dumb sheep? Or do you set yourself to think, study and PROVE what is God's will through His Word, the Bible? God says: "PROVE all things; hold fast that which is good" (I Thess.5:21). God reveals that the people of Berea in Paul's day were a good example of how you ought to hear our message — or that of anyone who is sincere and who is fallowing the Bible. Luke writes: "These were more noble than those in Thessalonica, in that they received the word with all readiness of mind, and searched the scriptures daily, whether those things were so" (Acts 7:11). First, notice that the Bereans received the word with a ready mind — being quick to accept what was obviously based on God's Word and His Law. To back this up, they searched the Scripture daily — really STUDYING the Bible and not taking anything for granted one way or the other. Also, seeing that Paul's message was indeed based on the Bible over all, they studied with a positive attitude — not negatively, sarcastically or deliberately trying to "chip away" at what he was teaching. In type, a modern apostle Paul is preaching to you through this very Work! You need to GRASP what is happening and RESPOND to it with an open heart and a willing and zealous mind! God says: "For not the hearers of the law are just before God, bat the DOERS of the law shall be justified" (Romans 2:13). Just realizing, understanding and agreeing that this Work is being used to prophesy the major events now beginning to unfold in world affairs and to teach the true way of life revealed in the Bible is not enough. God says you must be a DOER of the Word — and not a hearer only (James 1:22). You need to realize the importance of the knowledge you are receiving through Plain Truth and Put it to work in your life! Actually, the whole purpose of your human existence is to qualify to be literally her n into the Kingdom of God. That Kingdom is a family grown great into a war id government. In the very beginning of the Bible, God said: "Let us make man in our image, after our likeness: and let them have DOMINION over the fish of the sea, and over the fowl of the air, and over the cattle, and over all the earth, and over every creeping thing that creepeth upon the earth" (Gen. 1:26). Immediately we notice that we are made after God's likeness — potentially capable of RULING as does God Himself. Therefore, in the very beginning God gave man "dominion" or RULE over every other creature on the earth. For man was being trained in right government — the lessons of how to exercise authority properly. Are you learning that lesson? The third chapter of Genesis tells the story of the so-called "fall" of man. Actually, man didn't "fall" at all — for he took the very first opportunity to sin which was given him. His human nature was evil from the beginning. God created him with that human nature, of course, but gave him the mind power to rule over it, if Adam had wanted to. God Almighty purposed that man be allowed to write bitter lessons in human suffering during this first six thousand years of human history. He has allowed man to go his own way — devise his own systems of government, religion, education, society, etc. In the end, when he has been taught the lesson he has been writing in human suffering, man will realize how wrong are his own ways and how much BETTER the ways of God ! Notice now, in Genesis 3, how Satan got Eve to thinking that God's ways were "unfair." After being commanded by God not to eat of the tree containing a bad mixture of good AND EVIL, the woman answered Satan's challenging question by reminding him that God had said she and Adam would die if they touched or ate of this tree (verses 2-3). "And the serpent said unto the woman, Ye shall not surely die: For God doth know that in the day ye eat thereof, then your eyes shall be opened, and ye shall be as gods knowing good and evil." Immediately, Satan began to put God in a bad light — implying that God was UNFAIR. Satan gave the distinct impression that God was "afraid" that Adam and Eve would become as smart as He was if they experienced evil and ate of this tree! Here Satan began to cause the woman to "REASON" in her mind various motives for what God said rather than simply OBEYING HER MAKER! This is a vital principle to understand for human beings have been doing THIS VERY THING ever since! This is WHY Adam and Eve could not be given eternal life, glory and honor right then! For they would have had Power WITHOUT RESPONSIBILITY! As members of God's own family — GLORIFIED Spirit Beings — Adam and Eve might have literally WRECKED part of this universe before being stopped by God the Father! At the time of the "temptation" they were obviously NOT READY to be given eternal lip e and POWER in the Family of God! God will not save any soul He cannot RULE! From the very beginning of creation, the problem has been whether man would OBEY his God — or would argue, "reason," justify self, and use human excuses to DISOBEY his Maker. How Do You REACT to God's Instructions? God says: "To this man will I look, even to him that is poor and of a contrite spirit, and TREMBLES at my word " (Isa. 66:2). When something is clearly shown you out of the Bible, God's inspired word do you automatically say: "Yes sir!" to God? Do you begin immediately to DO what God's Word has instructed? Any captain in the army, any boss or supervisor over any organization anywhere is concerned with this problem. This is not some strange or unusual Principle. This is the BASIC concern of Almighty God about YOU, personally! Once you have been shown something from the Bible, will you zealously RESPOND to orders from your Creator? What kind of "kingdom" do you think God has, anyway? Do you think He is going to have a lot of REBELS running loose in His Kingdom forever and ever? Certainly this is not the way many preachers of our present society look at it ! They have a theoretic, vague approach to a kind of sentimental, namby-pamby, fuddy-duddy, doddering old being off in the sky somewhere whom they dub "god"! But the real GOD of heaven they know not! He is planning a literal government on this earth to be composed of the glorified Saints who have learned to OBEY their Maker! It is time you learned this fundamental and all important TRUTH! Nothing could be more basic or more easy to understand — for those who are willing. Throughout His word, God tells us NOT to use human reason in deciding how we want to worship Him. Rather, He commands us to worship Him — NOT "according to the dictates of our consciences" — but according to His Word! In this principle of His very character, He has always been the same — yesterday, today and forever. And in instructing ancient Israel about their worship, God commanded: "When the Lord thy God shall cut off the nations from before thee, whither thou goest to possess them, and thou succeedeth, and dwellest in their land; take heed to thyself that thou be NOT snared by following them, after that they be destroyed from before thee; and that thou inquire NOT after their gods, saying, how do these nations serve their gods? Even so will T do likewise" (Deut. 12:29-30). Here God plainly shows that it is REBELLION to try to adopt the customs of the people of this world — the ancient pagans or the "educated pagans" of today — and attempt to worship the living Creator according to these vain human traditions! Rather, as Jesus said: "Man shall not live by bread alone, but by EVERY WORD OF GOD (Luke 4:4). Therefore, God tells ancient Israel and us today in Deuteronomy not to follow pagan traditions in attempting to worship Him. "Thou shalt NOT do so unto the Lord thy God; for every abomination to the Lord, which He hateth, have they done unto their gods; for even their sons and their daughters have they burnt in the fire to their gods. What thing so ever I command you, observe to do it: thou shalt not add thereto, nor diminish from it" (verses 31-32). God commands His people to do EXACTLY what He says! We are not to "add" to God's word or instructions — bringing in foolish pagan customs and ideas which "seem right" to a man (Prov. 14:12). Neither are we to take from God's word or water down or diminish His instructions in ANY way! Yet, today, we behold the pitiful spectacle of professing ministers of Jesus Christ twisting, perverting, distorting and Blaspheming the name of the God of heaven by openly advocating disobedience to this or that of God's commandments, saying that certain books in the Bible were not inspired or ought not to be there or ought not be obeyed, or even advocating their Satan inspired doctrine that "God is dead"! That true God of the Bible who seems "dead" to some of these smart-aleck "intellectuals" is now beginning to intervene dramatically in human affairs! Soon, very soon He will literally SHAKE every island and every mountain on this earth out of its place in the greatest earthquake in human history! Before this present generation is past, the entire earth will truly Know that the God of the Bible is very much ALIVE and in charge of this earth and the entire universe! Does Your Faith in God Produce ACTION? But many of you, of course, will say: "But I already believe in God and have never doubted His existence!" But do you ACT that way? Do you RESPOND to God s instructions in His inspired Word? Do you really CHANGE when you are shown to be wrong and literally live by every word of God? Do you zealously Study Plain Truth magazine — looking up the scripture references in the Bible — PROVING the truth and then really living by it? Do you follow The WORLD TOMORROW broadcast with your Bible open — taking notes on scriptures and important points — proving it and really living by it? For an example of the kind of LIVING faith which Jesus Christ taught, read carefully the example of the Roman centurion found in Matthew 8:5-13. The centurion had a sick servant and he sought Christ to heal him. But, having humility and realizing his Gentile background, he told Christ that he was not even worthy for Him to come under his roof. He said: "but speak the word only, and my servant SHALL be healed" (verse 8). Then, this Roman captain described the principle of living faith in a way that made Christ remark about it enthusiastically. He said: "For I am a man under authority, having soldier under me: and I say to this man, go and he goeth; and to another, Come, and he cometh; and to my servant, Do this, and he doeth it" (verse 9). In other words this Roman soldier knew that when Christ gave a command over sickness and disease, it HAD to be obeyed! For the Roman soldiers under him automatically said: "Yes sir!" when they were given a command. This Roman centurion grasped the fact that whatever Jesus Christ commanded was right — it would work — and it would be BACKED UP by God in heaven. He obviously and fervently BELIEVED that. The point is, when Jesus Christ gives a command or instructions to you through His Word or through this very Work of God — as you prove it in the Bible — do you realize that God's laws and instructions ALWAYS WORK OUT Right? That you can and should have total FAITH in living by them? That God stands behind them and BACKS THEM UP? That whenever you have realized or proved that any command or instruction comes from God you should learn automatically to say: "Yes sir!" and DO what your Creator instructs? Somewhere along the line, you had better PROVE — and know that you know — where Jesus Christ is working. You need to find out where Christ's true servants are and follow their example — learn gladly from them — and ACT on the truth of God. God says: "Remember them which have the rule over you, who have spoken unto you the word of God: whose faith follow considering the end of their conversation" (Heb. 13:7). Christians are here instructed to fallow the example of the faithful ministers who truly preach God's Word. They are instructed to RESPOND quickly and gladly to these true servants of the living Christ — saving themselves much heartache and many mistakes over the long run. "OBEY them that have the rule over you, and submit yourselves: for they watch for your souls, as they that must give account, that they may do it with joy, and not with grief: for that is unprofitable for you" (verse 17). Again, God instructs His people whom He is calling to RESPOND to the true ministers of Christ. You need to cultivate the habit of steadying of truly PROVING all things in the Bible — and then RESPONDING to God's servants as they teach you His Word. Don't just hear but ACT on the instruction of God and change your life to follow the example set by Jesus Christ and His true servants. Before God calls us and BREAKS our stubborn wills, many of us have been "hardheads." We have been slow, stubborn and loath to change from OUR WAY of life and over approach to spiritual truth. We naturally want to follow the crowd — to have the approval of MEN As the unconverted Jews of Jesus' day, we want to follow "the traditions of our fathers" — which are all too often RANK PAGANISM. We tend to say: Here is the way I LOOK AT IT... here is MY opinion." If this be your problem, God help you to WAKE UP! God help you to understand and realize that this is His VERY WORK on earth — bringing the LAST WITNESS of His impending intervention to a rebellious and confused society! God help you to REPENT and to get over on His side. For He will surely never get over on your side as such. Never forget the example of Jesus Christ sending out the seventy young men, two by two (Luke 10:1-16). For these young men were certainly not "recognized" by the worldly authorities of their day. They had no "credentials" no approval of any ministerial council or any organization of men. But they were preaching THE WAY of God — the message of God's Kingdom which Jesus had taught them (verse 9). The very Son of God told these young men as He sent them out: "He that heareth you heareth me; and he that despiseth you despiseth me; and he that despiseth me despiseth him that sent me." The marginal rendering for the Greek word here translated "despiseth" is rejects. In other words, those who rejected those young servants preaching "the Kingdom of God" were REJECTING JESUS CHRIST! SO PROVE by real steady and prayer where Christ is working. Then follow the true servants of the Living Christ. In Ezekiel 33:1-11, God reveals that the peoples of modern America and the British Commonwealth nations will have a "watchman" to warn them of the final Tribulation which is soon coming in our day. If that watchman FAILS to preach the truth and WARN the people — then their blood will be required at the watchman's hand. God is speaking to those of us in this very Work! "So thou, O son of man, I have set thee a watchman unto the house of Israel; therefore thou shalt hear the word at my mouth, and warn them from me" (verse 7). This prophecy was written, of course, over one hundred years after Israel's first and only captivity. It refers to the final Tribulation on the modern "house of Israel" — identified in your Bible as the British Commonwealth and the U.S.A. today. 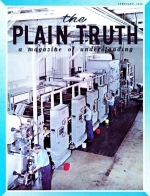 Those of us helping to get out The WORLD TOMORROW broadcast and Plain Truth magazine are in that very Work. We will be held ACCOUNTABLE if we do not warn the peoples of modern Israel with clarity and POWER. "Nevertheless," God says, "If thou warn the wicked of his way to turn from it; if he do NOT turn from his way, he shall die in his iniquity; but thou hast delivered thy soul" (verse 9). But God does NOT rejoice — and certainly neither do we — in the fact that some refuse to RESPOND to the definite warning being given them through this Work to return to the true God of Israel! He says: "As I live, saith the Lord God, I have no pleasure in the death of the wicked; but that the wicked should turn from his way and live: TURN YE, turn ye from your evil ways; for WHY WILL YE DIE, O house of Israel (Verse 11)? As Christ's servants we beseech you in sincere love; DON'T just be an "interested listener," or an "interested reader." Diligently Study prove and ACT on the truth which is being imparted to your mind and heart this very minute! "Be ye DOERS of the Word, and not hearers only, deceiving your own selves" (James 1:22). Learn to RESPOND, to learn, to change, to grow in the knowledge of the Living Christ. In the same manner, learn to respond and ACT on the Truth — the entire way of life — being preached through His true servants today!